Description: This webinar will discuss the steps required to conduct a Risk Assessment under the HIPAA Security Rule. June 2015: Conducting a Risk Assessment. Conducting an effective Risk Assessment is a daunting task no matter how often you may have done it. However, if it's your first time then your anxiety level is likely to be an order of magnitude higher. Although what we are going to discuss in the article is not a magic elixir for reducing your anxiety, it may help you to put things in proper perspective. The silver bullet in a nutshell is that there is "no such thing as a perfect Risk Assessment" and there is no compliance requirement for one. The objective is not perfection, but rather the objective is to establish a baseline that you can continue to improve on over time. A Risk Assessment is not something that you perform once and then forget. Because the threat landscape changes on a daily basis, it is inconceivable that you could perform a rigorous "full blown" Risk Assessment less than once a year. Further, it is more likely that once a quarter should be what you strive for. Now the HIPAA Rules do not mandate the frequency of Risk Assessments, rather the Rules require that you perform a Risk Assessment whenever your operational environment, or the law, changes in a material way. That said, a couple of points need to be noted: (1) given the amount of change occurring in the healthcare industry (now and in the foreseeable further) operational environments are going to be changing quite often; and (2) if your objective is to manage risk then performing a Risk Assessment once a year is simply not a "reasonable and appropriate" thing to do. Remember that the Security Rule uses words such as "reasonable and appropriate" ("weasel words") to give HHS the most flexibility possible for determining when the frequency of Risk Assessments, and other repeatable tasks, are required.The bottom line is that you are going to learn to love performing Risk Assessments in the same way that a CPA learns to love taxes. That is, because it is mission critical to your business. In this article we are going to cover the basic lingo of Risk Assessments. Performing a Risk Assessment is like learning a foreign language. You first have to learn the basic "grammar" otherwise you will never be able to see the forest for the trees. Adequate Security: Security commensurate with the Risk and magnitude of harm resulting from the loss, misuse, or unauthorized access to or modification of ePHI. or destroy Information System resources or the ePHI itself. prerequisite to allowing access to resources in an Information System. Availability: Ensuring timely and reliable access to and use of ePHI. including means for protecting personal privacy and proprietary ePHI. destruction of ePHI, or loss of ePHI or ePHI system availability. Individual: Individual is synonymous with a workforce member. collection, processing, dissemination, and disposal. ensuring ePHI non-repudiation and authenticity. given threat is capable of exploiting a given Vulnerability or a set of Vulnerabilities. constraints, risk tolerance, and priorities/trade-offs. the resulting impact if this should occur. and (4) The likelihood that harm will occur. Management program, and associated activities to support Risk decisions. assets, individuals, or other organizations. system, or a group of systems, that can compromise operational availability. Physical Safeguards are applied to. power failures, pollution, chemicals, and liquid leakage. is likely to hinder your ability to deliver products and services to your customers. implemented and/or configured Information Systems. Of course you are not going to learn a new grammar simply by learning a new vocabulary, BUT that's a good place to start. Tune in to this month's FREE Webinar to learn more about Risk Assessments. 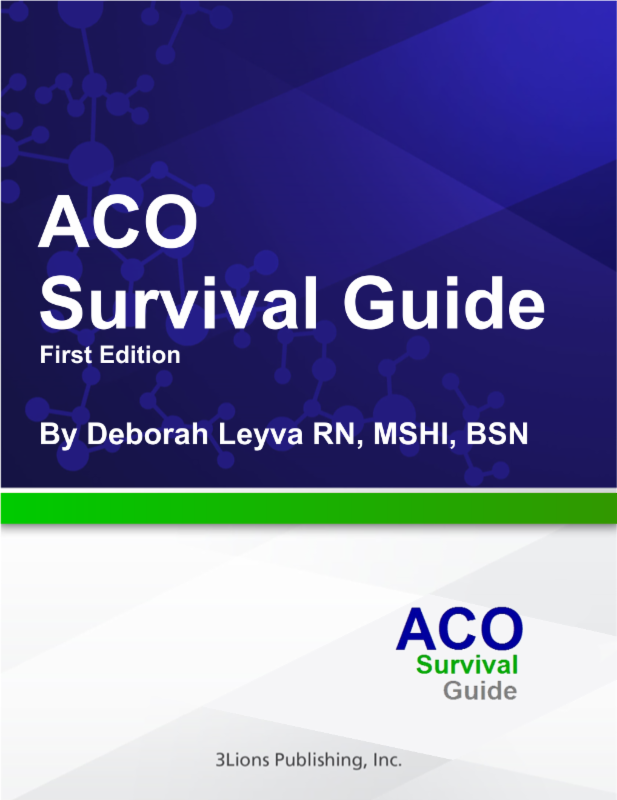 The first edition of the ACO Survival Guide (Guide) provides an overview of the regulations and the challenges and strategies for successful establishment of an Accountable Care Organization. It supports the educational needs of ACOs and discusses obstacles and challenges related to the performance standards to which ACOs must achieve in order to receive their portion of the savings provided to Medicare. In addition, the Guide also discusses the need for data aggregation and monitoring quality metrics with a robust technical architecture. The Guide provides a roadmap for compliance within the existing regulatory scheme and insights going forward as the pay for performance model continues to evolve. It discusses the People, Process, and Platform challenges faced by all ACOs as they attempt to navigate the white water rapids of the disruptive forces that are transforming healthcare as we know it.